Abstract. Chloride channels are involved in a multitude of physiologic processes ranging from basal cellular functions such as cell volume regulation and acidification of intracellular vesicles to more specialized mechanisms such as vectorial transepithelial transport and regulation of cellular excitability. This plethora of functions is accomplished by numerous functionally highly diverse chloride channels that are only partially identified at the molecular level. The CLC family of chloride channels comprises at present nine members in mammals that differ with respect to biophysical properties, cellular compartmentalization, and tissue distribution. Their common structural features include a predicted topology model with 10 to 12 transmembrane regions together with two C-terminal CBS domains. Loss of function mutations affecting three different members of the CLC channel family lead to three human inherited diseases : myotonia congenita, Dent's disease, and Bartter's syndrome. These diseases, together with the diabetes insipidus symptoms of a knockout mouse model, emphasize the physiologic relevance of this ion channel family. Chloride is the predominant anion of the extracellular milieu. Various transporters and channels participate in the translocation process of chloride ions across both cellular plasma membrenes and membranes of intracellular organelles. Although none of the hitherto identified chloride transporting proteins directly consumes ATP, several transporters gain advantage from the energy stored in transmembrane gradients of other ions to move chloride uphill against its electrochemical gradient. Coupling to the sodium gradient (maintained by the Na,K-ATPase) allows accumulation of chloride intracellularly above its equilibrium concentration. This concept is realized by NaCl- and NaK2Cl-cotransporters, of which several isoforms were identified at the molecular level. On the other hand—due to the inverse transmembrane distribution of potassium—a structurally related group of KCl-cotransporters (consisting of at least four members) is capable of lowering intracellular chloride concentration below equilibrium. Other transport proteins involved primarily in intracellular pH regulation may additionally affect the chloride gradient. This applies to Cl/HCO-3 exchangers, which accumulate chloride within the cell during HCO-3 secretion, and to Na-linked Cl/HCO-3 exchangers, which extrude chloride ions while accumulating Na and HCO3. Despite the influence of the aforementioned transport proteins on intracellular chloride concentration, the electrochemical gradient of chloride across the plasma membrane is generally not far from equilibrium. Thus, at the resting potential of cells, opening of chloride channels will neither lead to large excursions of the plasma membrane potential nor to dramatic changes in intracellular chloride concentration. The importance of passive chloride diffusion through chloride channels comes to the fore mainly when either the membrane potential or the chloride concentration gradient across the membrane severely deviate from the electrochemical equilibrium. This occurs for example during strong membrane potential depolarizations in the course of an action potential or during excessive accumulation of intracellular chloride driven by secondarily active transport processes. In the first case, potential-driven chloride influx through chloride channels contributes significantly to the repolarization of action potentials (as observed in skeletal muscle cells). In the latter, concentration-driven chloride efflux through chloride channels allows bulk flow of chloride as observed in chloride-secreting or -reabsorbing epithelia. In the central nervous system, the electrochemical gradient for chloride across neuronal plasma membranes determines the action of GABA and glycine, whose receptors constitute chloride channels that open upon ligand binding. Opening of these channels drives the membrane potential toward the reversal potential for chloride. Because the chloride reversal potential of a typical nerve cell is about -70 mV and therefore at some distance from the threshold (-55 mV) for generating an action potential, an inhibitory synaptic action is induced by GABA and glycine. Shifting the chloride reversal potential to more positive values—for example by intracellular chloride accumulation observed in some neurons during early stages of central nervous system development—turns the inhibitory into an excitatory action of these neurotransmitters. Moreover, additional physiologic examples for the importance of passive chloride diffusion through chloride channels are found in nearly all mammalian cells. These examples include the role of chloride channels in the process of both cell volume regulation and acidification of intracellular organelles. Cell volume regulation by activation of chloride channels depends on the extrusion of chloride, which together with the concurrent movement of potassium as positively charged counterion reduces intracellular solute content. Due to the high water permeability of nearly all plasma membranes, changes in cell solute content have parallel effects on the volume of the cell (1). The supportive role of chloride channels in acidification of intracellular vesicles on the other hand is based on the movement of negative charges through these channels. This partially neutralizes the positive charge movement driven by the electrogenic proton ATPase, which otherwise would have to pump protons against a positive intravesicular potential. The resulting electroneutral transport of HCl allows higher vesicular pH gradients to be achieved (2). In view of this whole host of functions, it is not surprising that numerous distinct chloride channels have been identified on the functional level based on electrophysiologic characteristics such as conductance, ion selectivity, and gating behavior, as well as pharmacologic sensitivities. This variety of functionally distinct chloride channels, however, is far from being mirrored in the number of hitherto cloned chloride channel genes. Up to now only three unambiguously accepted structural classes of such genes have been identified (3) : ligandgated chloride channels (GABAa and glycine receptors), the cystic fibrosis transmembrane conductance regulator (CFTR) (a member of the ATP-binding cassette family of transport proteins), and the CLC family of chloride channels. The molecular correlates of several important functionally defined classes of chloride channels, as, for example, the outwardly rectifying chloride channel or chloride channels activated by calcium or cell swelling, are still controversial. This review will focus on molecular and physiologic aspects of the CLC chloride channel family, emphasizing the role of disturbed CLC channel function in human disease. The initial cloning of the Torpedo electric organ chloride channel ClC-0 (4) was the crucial event for the discovery of a large gene family (Figure 1). There are now nine different CLC genes known in mammals (5), and it has been found that CLC genes are highly conserved during evolution with representatives in organisms as diverse as animals, yeast, plants, eubacteria, and archaebacteria (5). The structure of this new channel family showed no homology to other previously cloned ion channels and did not share any comparable sequence motifs with other cloned chloride channels such as the ligand-gated chloride channels or CFTR. A detailed biochemical study of the transmembrane topology of CLC channels performed on the muscle chloride channel ClC-1 demonstrated the intracellular localization of the N- and C-termini of the protein (6). In accord with extended hydropathy analysis, a topology model was suggested with 10 to 12 transmembrane domains (Figure 1). The uncertainty in the number of membrane-spanning regions arose from a broad hydrophobic region at the C-terminal end of the transmembrane-spanning block that was difficult to analyze, and it is still unclear whether this so-called D9-D12 region spans the lipid bilayer 3 or 5 times. This limitation, together with the controversy about the topology of the D4 region suggested to be located extracellularly in one study (6) and to span the membrane in another study (7), points out that the transmembrane topology of CLC channels is not yet entirely resolved. Crystal structure determination of CLC channel proteins (presumably at first from bacteria), together with further topologic studies, will be necessary to clarify this point conclusively. The CLC family of chloride channels. (Top) The dendrogram indicates the degree of similarity between different human CLC gene products. Mammalian CLC channels are grouped into three branches. 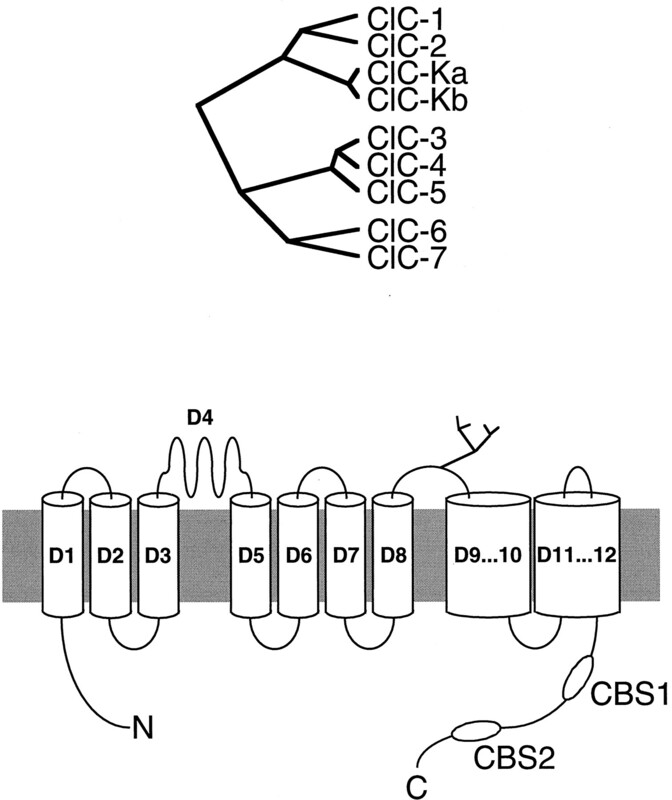 The first one includes ClC-1, ClC-2, and the ClC-K channels (ClC-0, the Torpedo channel, also belongs to that branch). The closely related ClC-3, -4, and -5 channels form the second branch. The third branch contains ClC-6 and ClC-7. (Bottom) The transmembrane topology model of CLC channels as proposed by Schmidt-Rose and Jentsch (6). N- and C-termini are located intracellularly. A glycosylation site in the extracellular loop between transmembrane regions D8 and D9 is indicated, as well as the two CBS domains at the intracellular carboxy terminus. Apart from the well conserved transmembrane topology, all mammalian and most of the other CLC channel proteins share another structural feature : a tandem repeat of CBS domains in the cytoplasmic carboxy terminus (8). CBS motifs—named after their presence in cystathionine-β synthase—appear in many different proteins (9,10), but their function is still obscure. A mislocalization of the yeast CLC protein (gef1) (11) observed after mutations in these domains (12) suggested that CLC CBS domains may be involved in the sorting process. Since the deletion of the second CBS domain in ClC-1, however, still was compatible with channel function (13), there seems to be no absolute requirement for that domain. In contrast to either ligand-gated anion channels or voltage-gated cation channels that consist of a single pore surrounded by several (5 and 4, respectively) homomeric or heteromeric subunits (14,15), CLC channels show a completely different architecture. Even before its molecular identification, the ClC-0 channel from the electroplax (the electric organ of the ray Torpedo) was shown to have a peculiar “double-barreled” structure with two apparently identical pores that gate independently from each other (“fast gates”), but which can additionally be gated simultaneously by another common gate (“slow gate”) (16,17). The following two observations cleared the way for the model of a “double-barreled” homodimeric structure with each pore formed by a single ClC-0 protein. First, the expression of the ClC-0 cDNA alone was sufficient to reproduce the “double-barreled” structure, excluding the need for an additional subunit (18). Second, the expression of hybrid channels by assembling wild-type subunits with mutated subunits determined the presence of two pores, the wild-type and the mutated pore, in one single channel (19,20). Recent experiments have shown that the same concept likewise applies to the skeletal muscle chloride channel ClC-1 (21,22) and thus may represent a general feature of CLC chloride channels. This model, however, was not passed unchallenged and an alternative model for ClC-1 was proposed with a single pore composed of two subunits (23). It appears rather unlikely though that the architecture of ClC-1 differs from that of ClC-0. The pore of CLC channels is as yet poorly defined. As expected for a channel in which probably just one protein subunit forms a pore, mutations in several regions of CLC channels led to changes in pore properties. In the cation channel superfamily, well defined charged protein residues within a transmembrane domain (the S4 segment) sense the electric field over the membrane and lead to conformational changes (gating) that open or close the pore. However, the voltage-dependent gating of CLC channels may be based on a completely different mechanism. The gating of ClC-0 (24), ClC-1 (25), ClC-2 (25), and a CeClC channel (26) (a voltage-gated chloride channel from the nematode Caenorhabditis elegans) depends on the permeating ion as the gating charge. For ClC-0, a model was proposed in which the presence of the anion at the cytoplasmic end of the pore facilitates channel opening (24). Because the anion moves along the electric field on the way through the pore to its binding site, gating becomes voltage-dependent and dependent on the ambient anion concentration. A refinement of this model suggested an external chloride binding site that moves together with the bound anion in the electric field and thus confers voltage sensitivity to the channel (27). Skeletal muscle cells are large, multinucleated cells that result from the embryonic fusion of many myoblasts. It would be impossible for sarcolemmal action potentials to have any effect on the calcium stores in the center of a muscle cell, if it were not for the fact that the sarcolemma invaginates in form of the T-tubules to make contact with the calcium stores, i.e., the terminal cisternae of the sarcoplasmic reticulum. The long diffusion distances within the T-tubule system, however, hinder ion concentrations in efficiently equilibrating with the normal extracellular milieu and thus raise a problem : Repolarizing potassium currents would critically increase the intratubular potassium concentration after repeated action potentials and thereby depolarize the resting membrane potential. Beyond a certain limit, this would trigger new action potentials thus disturbing muscle relaxation after voluntary contraction. A distinct sarcolemmal chloride conductance normally resolves this problem by relieving the potassium conductance during action potential repolarization, thus preventing intratubular potassium accumulation. Because the intratubular (extracellular) chloride concentration by far exceeds intratubular potassium concentration, the effect of a decrease in intratubular chloride concentration during action potential repolarization can be ignored. Impaired muscle relaxation and muscle stiffness (myotonia) indeed is observed in several inherited diseases, which show a decrease in sarcoplasmic membrane chloride conductance (28,29). Soon after expression cloning of ClC-0 from electrocytes (which can be imagined as modified polarized muscle cells) of the ray Torpedo, homology screening identified ClC-1 as a chloride channel gene expressed nearly exclusively in skeletal muscle (30). The perfect agreement between ClC-1 and the macroscopic skeletal muscle chloride conductance with regard to both developmentally regulated appearance of expression and electrophysiologic properties strongly suggested that ClC-1 is the molecular entity of this chloride conductance. This assumption was proven in the very same year by the observation of a mutated ClC-1 gene in the myotonic ADR mouse strain (31). The next year it was shown that mutations in the ClC-1 gene are also responsible for human myotonia congenita (32), which can be inherited as an autosomal recessive (Becker type) or as an autosomal dominant (Thomsen type) disease. Both forms are caused by mutations of ClC-1, the type of mutation determining the mode of inheritance. Mutations causing a total loss of ClC-1 function (e.g., severe truncations) lead to Becker type recessive disease, whereas all dominant mutations are missense mutations, which exert a dominant negative effect on ClC-1 channel function even of that encoded by the intact allele (almost always by shifting the voltage dependence of ClC-1 to very positive potentials) (33). This probably occurs via an effect on the common gate that controls both pores of the double-barreled channel. ClC-2 is a nearly ubiquitously expressed chloride channel (34) that activates upon rather strong hyperpolarization of the membrane potential, cell swelling (35), and lowering of the extracellular pH (36,37). It was shown that this type of gating depends on an N-terminal peptide domain that was suggested to bind like a “ball” to the cytoplasmic loop between transmembrane regions D7 and D8 (35,37). In contrast to these detailed molecular insights into ClC-2 channel gating, information on the physiologic role of this chloride channel is still sparse. Hyperpolarization-activated currents similar to those observed in ClC-2-expressing Xenopus oocytes have been described in different cell lines with a comparable sensitivity to cell swelling (38,39). This might suggest a role of ClC-2 in cell volume regulation, although ClC-2 certainly does not represent the swelling-activated chloride current ICl,swell described in many cell types. The latter current differs from ClC-2 currents by its ion selectivity and voltage dependence. ClC-2 may also serve to prevent intracellular chloride accumulation in specific neurons, thereby modulating the effects of postsynaptic GABAa receptors. ClC-2 expression is absent or low in neurons exhibiting a “paradoxical” excitation by GABA, attributable to a chloride efflux via GABAa receptors in cells with high intracellular chloride levels (40). Indeed, transfection of ClC-2 into dorsal root ganglia transforms the GABA response from excitatory to inhibitory (41). Thus, ClC-2 may be important for setting the intracellular chloride concentration and regulating neuronal excitability. Other speculative roles of ClC-2 channels include a potential parallel pathway to CFTR-mediated chloride secretion in the apical membranes of lung epithelia (42) and a supportive function in gastric epithelial acid secretion (43,44). Two highly homologous CLC proteins have been identified that are nearly exclusively expressed in mammalian kidney (45,46,47). A degree of identity greater than 90% between the homologues within one species hitherto thwarted the assignment to the corresponding species homologues, which is why these channels were named ClC-Ka and ClC-Kb in humans (47), and ClC-K1 and ClC-K2 in rats and mice (46,48). Somewhat bewildering, only one homologue was described in rabbit that was termed rbClC-Ka (49), although—as outlined below—it seems to correspond more likely to the ClC-Kb/ClC-K2 isoform. Remarkably, this high degree of sequence homology coincides with a close proximity of the ClC-Ka and -Kb genes within the human genome separated from each other by a few thousand base pairs only (50), which indicates a recent gene duplication event as the likely explanation for these findings. The rat ClC-K1 protein was shown to be exclusively localized to both the apical and basolateral plasma membranes of the ascending thin limb of Henle's loop (ATL) (51), with increasing expression levels paralleling urinary concentration after water deprivation (45,52). In the same study, the functional characteristics of ClC-K1 expressed in Xenopus oocytes were shown to match those of chloride transport in ATL observed in in vitro perfusion experiments. These charcteristics include the decrease of the respective currents after lowering the extracellular pH or calcium concentration, as well as their ion selectivity sequence of Br > Cl > I. In sharp contrast to the voltage-gated behavior of the other functionally analyzed CLC channels, gating of ClC-K1 is not voltage-dependent. The conclusion that ClC-K1 is the major chloride channel mediating the transepithelial chloride transport in ATL was recently confirmed by a mouse model in which ClC-K1 had been eliminated by homologous recombination (48). These mice show a massive vasopressin-insensitive diuresis that is typical for nephrogenic diabetes insipidus. The observed urinary concentrating defect was put down to a drastically decreased medullary tonicity due to reduced concentrations of both NaCl and urea in the kidney medulla. Transepithelial measurements from ATL segments proved the absence of chloride conductance in this part of the nephron (48). Other functions of the kidney obviously were not affected. In addition to revealing the physiologic role of ClC-K1, this study provides important insights into the countercurrent multiplication process of Henle's loop and sheds new light on the role of the ATL in this complex machinery (Figure 2).
. Physiologic role of ClC-5, ClC-K1, and ClC-Kb/K2 along the nephron as deduced from inherited kidney diseases. In the proximal tubule (PT), ClC-5 colocalizes with the proton ATPase in subapical endosomes. In the collecting duct (CD), a colocalization additionally is observed in the apical membrane of acid-secreting α-intercalated cells. In both cases, ClC-5-mediated chloride current could dissipate the positive charge generated during acidification by the proton ATPase. Disturbed endosomal acidification could explain the tubular type proteinuria observed in Dent's disease. Transcellular chloride reabsorption in the ascending thin limb (ATL) of Henle's loop is mediated by apically and basolaterally located ClC-K1 chloride channels. Reduced chloride reabsorption in this segment after deletion of the ClC-K1 gene in a mouse model causes dilution of the medullary hypertonicity and thus impedes water reabsorption leading to nephrogenic diabetes insipidus. In the thick ascending limb (TAL), chloride uptake over the apical membrane is mediated by a NaK2Cl-cotransporter. Potassium recirculates through apical ROMK potassium channels, whereas chloride leaves the cell basolaterally via ClC-Kb/K2 chloride channels. Disturbances in each of these three transport processes result in Bartter's syndrome, a salt wasting kidney disorder. In contrast to the restricted expression of ClC-K1 confined to the ascending thin limb of Henle's loop, ClC-K2 shows a broader expression pattern within the kidney. The close structural relationship between ClC-K1 and -K2 makes the generation of isotype-specific antibodies difficult, thus making the exact intrarenal localization of ClC-K2 a challenging task. Several studies, in which different antibodies were used, differed somewhat as to the localization to different nephron segments. One study using a serum that recognized both ClC-K1 and ClC-K2 demonstrated a rather wide distribution of immunoreactivity at the ATL, basolateral side of the TAL, and other distally located nephron segments (52). Another study reported the immunolocalization of rbClC-Ka at the basolateral surface of the thick ascending limb (TAL) and in the cytoplasm of intercalated cells in the cortical collecting duct (53). In a third study, the difficulties with cross-reactivity were overcome by using antisense riboprobes directed against the nonhomologous ClC-K1- and ClC-K2 3′ -untranslated regions (54). This in situ hybridization study demonstrated high expression levels of ClC-K2 mRNA in the distal convoluted tubules, connecting tubules, and cortical collecting ducts. A moderate expression was described in the medullary TAL of Henle's loop, whereas the signal in the cortical TAL and in the outer and inner medullary collecting ducts was low. Searching for promoter elements involved in governing nephron—segment-specific ClC-K expression, parts of the promoter regions of both ClC-K1 and ClC-K2 genes were analyzed without finding such elements (55,56). With one exception (46), it has not been possible to functionally express ClC-Kb/K2 in heterologous expression systems. (The outwardly rectifying currents with an I > Cl selectivity as reported by Adachi et al. [(46)] strangely enough also appeared after expression of a ClC-K2 splice variant lacking a complete transmembrane domain [(46)] and resemble endogenous oocyte currents elicited by several unrelated proteins [(57)].) Together with the broad expression along the nephron, this circumstance would have rendered the enigma virtually unresolvable, to which native chloride current ClC-Kb/K2 can be correlated. Genetic evidence, however, answered this question : Mutations in the ClC-Kb gene cause Bartter's syndrome (58). This inherited renal salt wasting disorder is characterized by a disturbed NaCl reabsorption in the TAL. This puts ClC-Kb into a functional relationship with the apical NaK2Cl cotransporter and the ROMK potassium channel, whose inactivation cause other variants of Bartter's syndrome (59, 60), suggesting a mechanism in which chloride is taken up apically by the cotransporter and exits basolaterally via ClC-Kb (Figure 2). The missing unambiguous electrophysiologic characterization, however, still hinders the correlation to native chloride currents described in the basolateral membrane of the TAL. Although the interspecies correlation of ClC-Ka/-Kb to ClC-K1/-K2 on the basis of structural criteria is not feasible, on the basis of functional criteria derived from the described molecular genetic approaches we can now correlate ClC-Ka to ClC-K1 and ClC-Kb to ClC-K2. Loss of function mutations in the human ClC-Ka gene thus should give rise to diabetes insipidus-like symptoms, whereas the knockout of the ClC-K2 gene should provide an animal model for Bartter's syndrome. Two highly exciting theories, which might be proven in the near future. ClC-5 (61, 62) belongs to a branch of the CLC family that also includes ClC-3 (63) and ClC-4 (64). Although only about 35% identical to the other branches, within this group they share a high degree of identity (approximately 80%). ClC-5 expression in Xenopus oocytes (62, 65) or mammalian cells (65) induces strong outwardly rectifying chloride currents upon depolarization to membrane potentials more positive than about +20 mV. One would expect this odd voltage dependence to preclude a physiologic role of ClC-5 in most nonexcitable cells, unless there were additional (hitherto unidentified) subunits that could modify this voltage dependence to more physiologic values. Only recently was it possible to functionally express ClC-4 in Xenopus oocytes and mammalian cells (65). Its marked outward rectification and ion selectivity resembles ClC-5, as do its pH sensitivity and the effect of a mutation at the end of D3 (65). By contrast, functional expression of ClC-3 provided contradictory data. Although some studies failed to observe ClC-3-induced currents (62, 65), other studies reported outwardly rectifying currents with an I > Cl selectivity (7, 63, 66, 67). Moreover, ClC-3 was proposed to represent the molecular entity of the swelling activated chloride current (67), even though the described currents differed in rectification, single-channel conductance, and calcium selectivity from those reported earlier (66). Although supported by alterations of current characteristics after mutagenesis of a ClC-3 protein residue (67), in view of the other contradicting data this issue has to be clarified by additional studies. The physiologic functions of ClC-3 and ClC-4, which show a broad expression pattern (63, 64, 68, 69), still remain elusive. As in the case of ClC-Kb, however, an inherited kidney disease provided valuable insights into the functional role of ClC-5 that is predominantly expressed in this organ (61, 62) : Dent's disease, which is caused by mutations in ClC-5 (70). Urinary loss of low molecular weight proteins is the most consistent abnormality of this X-linked kidney disorder. In addition, hypercalciuria is an early and common feature leading to secondary symptoms such as nephrocalcinosis and kidney stones that may culminate in renal failure. Many different ClC-5 mutations have been identified in Dent's disease (70,71,72,73,74), most of them severely affecting ClC-5-induced chloride currents as determined in heterologous expression systems. This convincingly proves that Dent's disease is due to disturbed ClC-5 channel function. The selective loss of small proteins points to a defect in the proximal tubule, where filtered low molecular weight proteins are normally reabsorbed by endocytosis. Indeed, immunocytochemistry revealed that ClC-5 is located in subapical endosomes of the proximal tubule, where it colocalizes with the proton ATPase and with reabsorbed protein (75,76,77). Thus, it is reasonable to speculate that ClC-5 may allow chloride to enter the endosome and dissipate the positive charge generated during acidification by the proton ATPase. Impaired acidification of this intracellular compartment due to loss of function of ClC-5 could in turn affect endocytotic processes, thus causing defective proximal tubular reabsorption of proteins (Figure 2). It is likely that other chloride channels, probably also from the CLC family, fulfill similar functions in other cells and organelles. A role for CLC channels in ionic homeostasis of intracellular organelles is now well established for the yeast CLC gef1p (12, 78). It is unclear how this process could explain the increased intestinal calcium absorption and elevated serum concentrations of active vitamin D in this disorder (79, 80). In some studies, ClC-5 was shown to be expressed in the TAL of Henle's loop (76, 77), which is the major site of renal calcium reabsorption. However, calcium reabsorption in this nephron segment occurs paracellularly driven by a positive luminal potential that results from the transcellular net transport of 2 Cl- ions combined with 1 Na+ ion (Figure 2). A disturbance in this process readily explains the hypercalciuria observed in Bartter's syndrome, but it does not explain it in Dent's disease, particularly as NaCl reabsorption in the TAL is not affected. The mechanism leading to hypercalciuria thus is still obscure (81). Recently, ClC-5 expression in a mouse model was reduced by a ribozyme approach (82). Surprisingly, although there was no change in ClC-5 mRNA levels within the kidney, an approximately 70% decrease in the amount of ClC-5 protein was observed. The transgenic ribozyme-expressing animals showed no obvious phenotype, and their renal function obviously was normal except for a borderline hypercalciuria. A barely significant elevation of urinary calcium was observed in male, but not female, animals under high calcium diet during the first few months after birth. It may be expected that a total knockout of the ClC-5 gene leads to a more convincing phenotype. In the collecting duct in addition to β-intercalated cells, expression of ClC-5 has also been reported in the acid-secreting α-intercalated cells (75, 77), where it again largely colocalizes with the proton ATPase in intracellular vesicles and in the apical plasma membrane (Figure 2). Although it seems reasonable to assume a role in proton secretion also in these cells, the physiologic importance of this observation is uncertain because urinary acidification is normal in the majority of patients with Dent's disease (83). The third known branch of the CLC gene family is represented by two CLC proteins that only share approximately 30% identity with the other CLC family members : ClC-6 and ClC-7 (84). Both proteins are expressed in nearly all tissues, and they appear early in mouse development. The genomic structure of both genes was investigated (85). As shown for ClC-6 (86), these proteins may be localized to intracellular compartments, thus explaining the failure to measure chloride currents in heterologous expression systems (47, 57). Additional studies will be needed to elucidate the physiologic functions of these putative channel proteins. The successive unveiling of the CLC chloride channel gene family yielded important insights into the variety of physiologic functions served by particular CLC channels. As impressively illustrated by several inherited diseases, the breadth of CLC channel functions extends from regulation of electrical excitability over pH regulation of intracellular compartments to transepithelial transport. Physiologic mechanisms as different as maintenance of normal muscle tonus or generation of the exceptional renal medullary tonicity depend on proper CLC channel function. Although in the past few years much has been learned about their structure, we are only beginning to understand how the different structural features of the CLC family members correspond to this diversity of functions. Moreover, there remain CLC channels with unclear physiologic importance. Both of these questions will give forthcoming studies strong impetus. This work was supported by grants from the Deutsche Forschungsgemeinschaft, the Cystic Fibrosis Foundation, and the Fonds der Chemischen Industrie. We thank Dr. Frank Weinreich for critical reading of the manuscript.